"We take this to Holiday parties and on camping trips. Dress up the jar, and it makes a great Holiday gift." In a large bowl, combine powdered milk, chocolate pudding mix, chocolate drink mix powder, creamer, confectioners' sugar, and cocoa. Divide the mixture between two 1 quart jars. Seal, and decorate as desired. These can be stored in a dry area for up to 3 months. 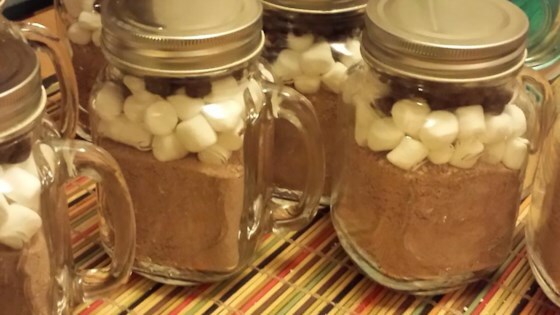 Attach a tag with the following instructions: Hot Cocoa: Dissolve 1/3 cup cocoa mix in 1 cup boiling water. Made wonderful little gifts last Christmas. I added my own blend of cinnamon and nutmeg... yummy. Will do again this year! Great recipe. Really quick and easy. My 4 year old loves it. Since Christmas is on a buget this year, we're giving this as gifts for the teachers. Good recipe, but I added extra powdered milk and felt it tasted better.